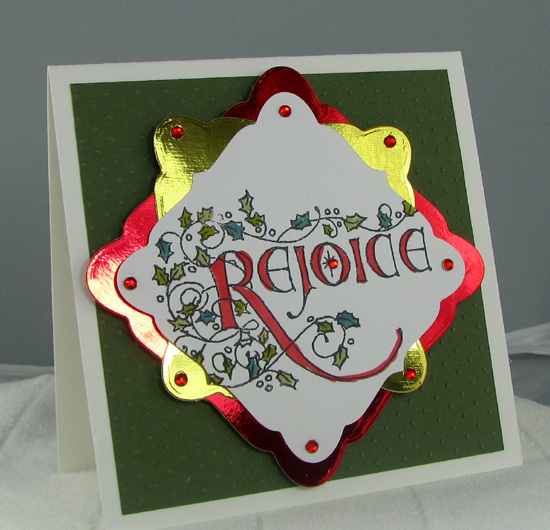 When Flourishes opened its virutal doors in August of ’07, the Rejoice set was among some of the first Christmas images the company released. It offered an elegant angel and scripted words perfect for the holidays! Just check out this elegant card by Betty Wright and you’ll see…. The Rejoice set has been retired, but part of the set – the word Rejoice – is making a comeback! It’s a single stamp and is one that is sure to make clean and classy Christmas cards for years to come!! It may be Release Week here at Flourishes but this single stamp is available NOW here! If you’d like to see how the Design Team used this oldie but goodie to create elegant Christmas creations, head on over and see….. This image was illustrated by my friend Joan Machincheck , a master calligrapher. I have always loved her work and am so glad that we own some of her creations. My card today takes this classic and adds some mirrored effects. With past card I have made them very elegant, but today I opted for a simple card that could be easily be repeated. I stamped my image on Flourishes Classic White cardstock with Memento Black ink. I used Copics to color the image using one from each of these groups: Evergreen, Spruce and Poppy. The image was cut with Labels Fifteen. Then the mirrored cardstocks from the store were used in Red Mirrored and Gold Mirrored Cardstock ( both available tomorrow in the Flourishes store). The gold is cut with the same size Nestie and the red was done using the largest die in the set. This mirrored cardstock works beautifully with the dies. Simple red rhinestones from Kaiserfive the finish the touch. The images were all attached to each other using Scor-It tape. The dark green cardstock was given some texture with a Cuttlebug dotted swiss folder. Dimensionals attach the focal image to the face of the card to make it pop. This entire card took less than 30 minutes, so I can reproduce it easily for the many Christmas cards that are needed for the Christmas season. Thanks for stopping in today, hope you have a bit of inspiration to take with you. What a beautiful card! This stamp is really pretty! They are both gorgeous but Bettys is so over the top elegant, I love it and have that stamp so will be casing hers soon. Beautiful use of the shiny paper with this beautiful stamp Jan Marie! Lovely! What a gorgeous card! This image is perfection and I love the colors you chose. Thanks. This is beautiful Jan Marie. You did a terrific job with this set.. Love the metallic.. Gives it a rich elegant look. Both cards are beautiful! Such a classy stamp. I especially like the first card – so elegant, but I can see the many different ways it can be used. Great stamp! Hi Jan Marie! My work pc let’s me comment! Shhh…I hope no one notices I am not working on a spreadsheet! LOL! This is very pretty! Love the metallic papers-lends such elegance! The gold on this is wonderful, and you picked the perfect jewel accents! Fabulous card.